Woodberry Way: Another Scrappy Trip! 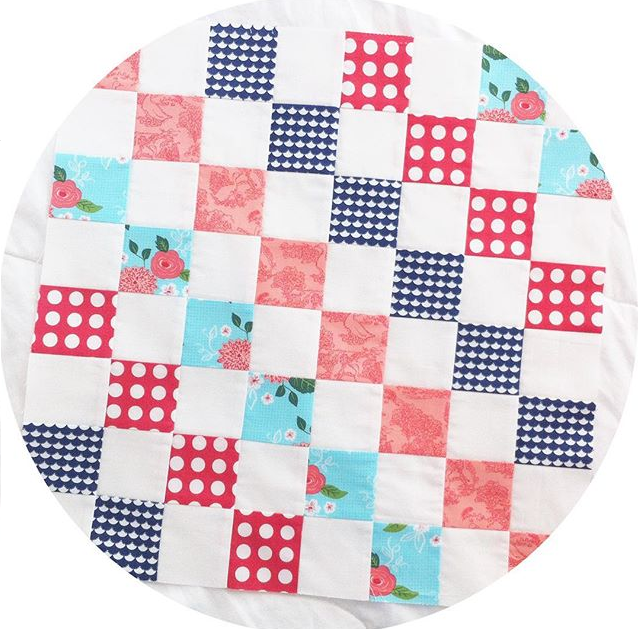 I made my first Scrappy Trip (pattern found here) last summer in red, aqua, and navy. It is one of my very favorite quilts and is the designated drive-in movie quilt at our house! I will post about that one another day. For now I wanted to answer some questions about my second Scrappy Trip, which is still in progress. I wanted to maximize my Gooseberry Jelly Roll (by Lella Boutique), and doing 12" blocks as the original pattern directs leaves quite a bit of jelly strip left over. So, I cut all the strips in half (approx. 21") and used 4 prints and 4 whites for each block, which gives you a 16" finished block. 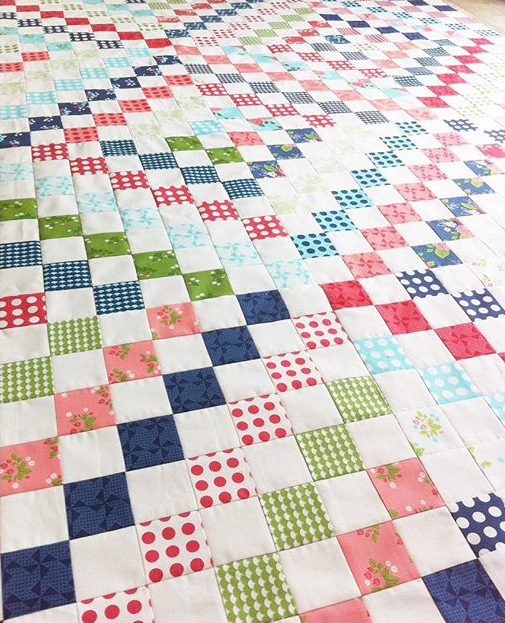 With one jelly roll and 3 yds of background yardage, you can get a 4 by 5 block quilt, which comes to 64" by 80", a very decent throw size, or it could squeak by as a twin. I think I actually like the 8 by 8 blocks better than the originals, as it makes the pattern slightly less busy. I hope that answers most questions about this quilt! It is one of my very favorites and I can't wait to gift it. It's just wonderful! 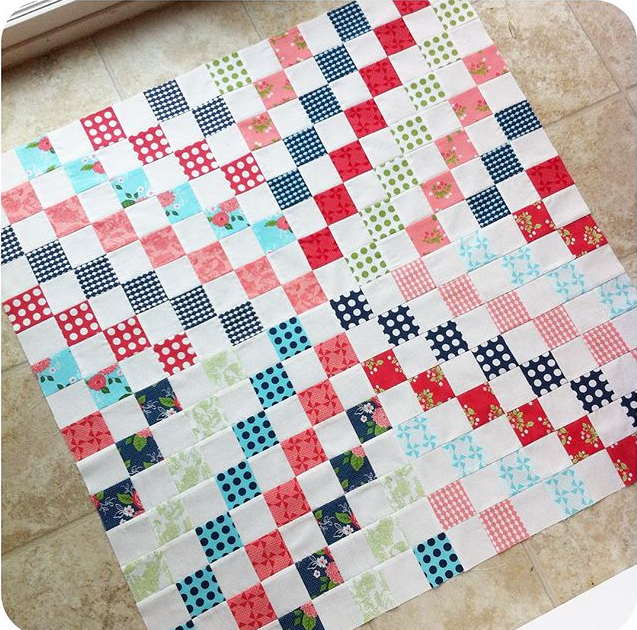 I have wanted to make a scrappy quilt for quite awhile. I have the jelly roll already. I just get bogged down with something else. Your quilt is just beautiful!! Thanks Judy! I just looked at your blog profile and you aren't too far from me. I live in Mather, just east of Sac. We want to move to a small town when we buy a house. I bet your area is just beautiful! Oh awesome! Thanks for posting this, I'm so excited to do this. I need a good picnic blanket!